So that’s all fine and dandy, but if you try to use your nifty new login form you’ll notice that clicking into the username or password box makes the popup menu disappear. Herein lies the problem that took a bit of searching and code reading to fix. The way Twitter’s bootstrap-dropdown.js is set up, this click causes the toggle method of this drop down to be fired, we need to prevent that. In order to do this, all we have to do is stop the propagation of the click event in the form input elements. Doing so will stop the event from being passed up the DOM tree, thus stopping bootstrap-dropdown.js from toggling the drop down display. Here’s the (short) JS file required to do this, including the bit I mentioned earlier to initialize the drop down plugin. That’s it! 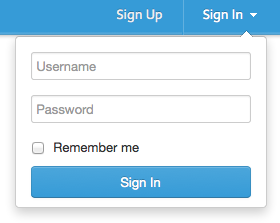 You can now use the form elements as normal and the drop down will still toggle as normal outside of the input elements.